Fancy building your own Stonehenge? In miniature that is. 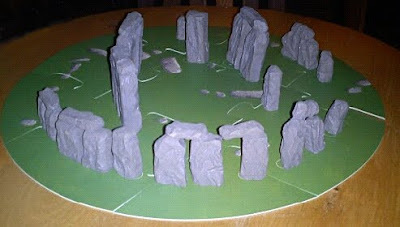 When I was looking for a present for a pagan friend, a boxed kit called Stonehenge: Build Your Own Ancient Wonder caught my eye. It consists of a book explaining what is known about the construction of Stonehenge and 16 little plastic rocks with instructions on how to put them together to recreate the ancient stone circle. Although it is supposed to be for kids, I was rather taken with it. I hoped my friend was too. Then, the other day, she sent me a picture of the completed model, which you can see above. Now we just have to wait for the Solstice to get it nicely aligned with the sunrise!